Healthy food can be - well boring. So during the year, I experimented with different dishes and ingredients so that this new way of eating would stick. Quinoa was one of those ingredients that I fell in love with. It is a nutty whole grain that is really high in protein. It is also rich in magnesium, which has been shown to reduce the frequency of migraines. Other than that, I love quinoa because it tastes great, cooks in 12-15 minutes and is very versatile. It's good in soups and salads and makes for a good breakfast when made warm almond milk and topped with fresh fruit. This salad is one of my favorite salads. It includes pretty much all of my favorite ingredients in one dish, is extremely flavorful, and it is super easy to make. I mix quinoa, spinach and dried cranberries with butternut squash that I roast with pure maple syrup, which is another ingredient I fell in love with last year. The butternut squash and the dried cranberries along with the apple cider maple vinaigrette dressing adds a little sweetness to the salad. The quinoa takes in all of those flavors, which makes it taste even better. 1. Preheat the oven to 400 degrees. Line a large sheet pan with aluminum foil. Place the butternut squash on the sheet pan. Drizzle the olive oil, maple syrup, salt and pepper and toss well. Arrange the squash in one layer and roast for about 30 - 40 minutes until fork tender. Toss the squash about halfway through with a spatula. Once the squash is cooked, set aside to cool. 2. 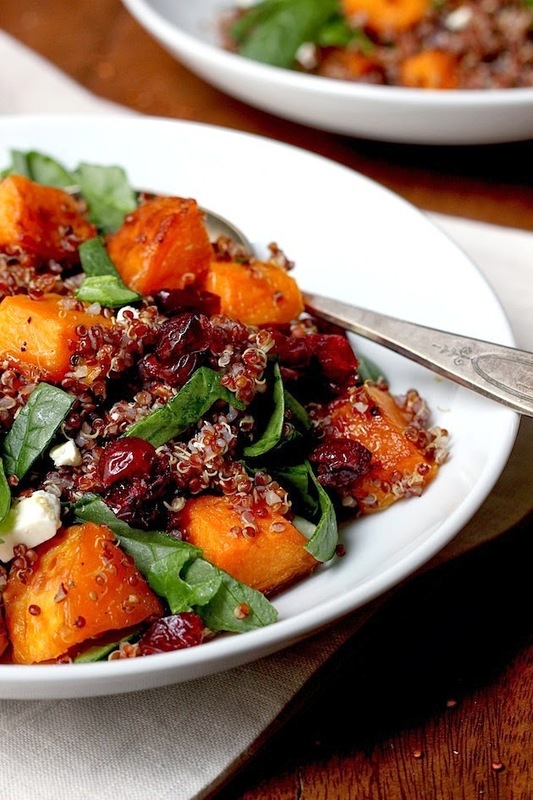 While the butternut squash is cooking, prepare the quinoa. 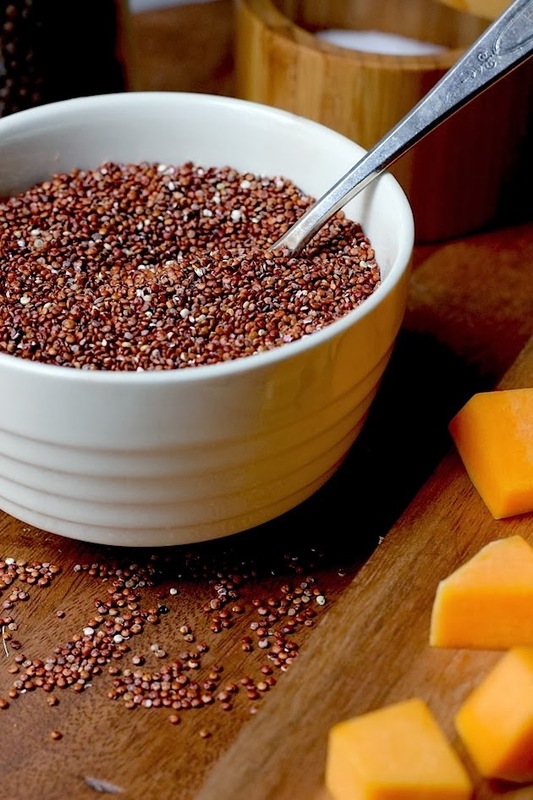 Place the dried quinoa in a fine mesh strainer and rinse it thoroughly under cold water. This will remove any grit and the soap-tasting coating from the quinoa. Add the quinoa, water and pinch of salt to a medium saucepan. Cover the saucepan with a lid and bring the mixture to a boil. Once it comes a boil, reduce the heat to low and let it simmer for 12-15 minutes, or until all of the water has evaporated from the quinoa. Once the quinoa is cooked, remove the saucepan from the heat. Remove the lid and place a paper towel on top of the saucepan. Put the lid on top of the paper towl and let the quinoa sit for 5 minutes. 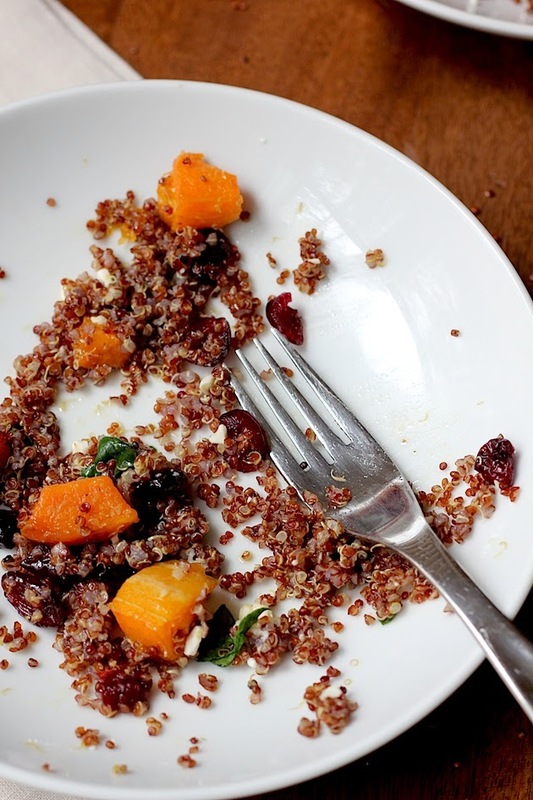 After 5 minutes, remove the paper towel, fluff the quinoa with a fork and set it aside to cool. That extra step puts moisture into the quinoa and makes it extra fluffy. 3. To make the dressing, add all of the ingredients to a small bowl and whisk until everything is combined. 4. 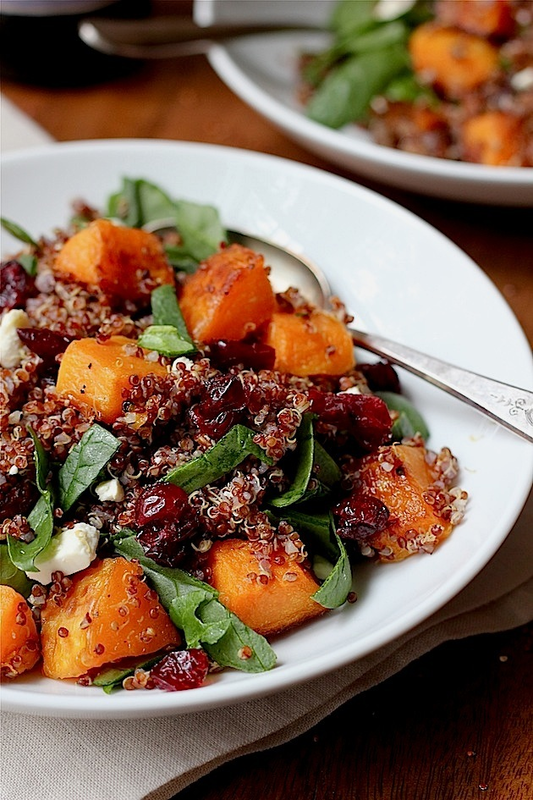 To assemble the salad, add quinoa, butternut squash, spinach, feta cheese and dried cranberries to a serving bowl. Pour the desired amount of dressing over the salad and gently toss to combine. * This makes a big salad, so store any leftovers in the refrigerator for up to 3 days. This looks delicious! Can I ask, what camera lens do you use? Your photography is so beautiful! YUM!! I'm totally making this. Thanks for the tip to make the quinoa fluffy, can't wait to try it. yum yum yum, so much my type of food! Will definitely make! I didn't enjoy this. The dressing was not nice, overpowering olive oil flavour with a biting sour acidity. The amount made is insane, no salad ever needs that much dressing. The proportion of quinoa and squash made for a mushy texture, and the feta taste just didn't go well at all. I wish I hadn't spent the $12 on maple syrup, because you couldn't even taste it.